Amuro Ray landed in Singapore recently. The first place he went to was Ngee Ann City in the heart of Orchard Road. But seems to me he is having some trouble finding a parking lot. Photo’s taken by Jinfeng83. Speaking of which, Ngee Ann City is one of the biggest shopping mall in Singapore. Kinokuniya Bookstore is on the third floor. They have a huge selection of English, Chinese and Japanese books and a large collection of American/Japanese comic/manga as well. Orchard Road is currently undergoing a face-lift. Construction and renovation can be seemed everywhere. 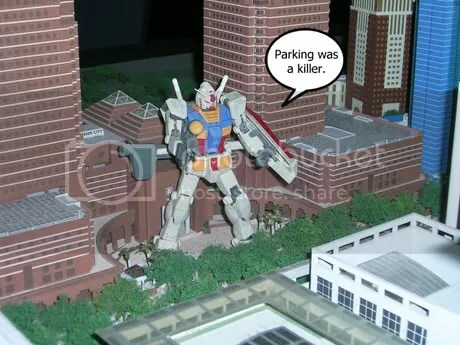 This entry was posted in Gundams, Singapore life. Bookmark the permalink. I laughed at the first pic, did you originally wanted to say “parking was a biatch”? Ownage. Epic Gundams are Epic, nice choice of pic. 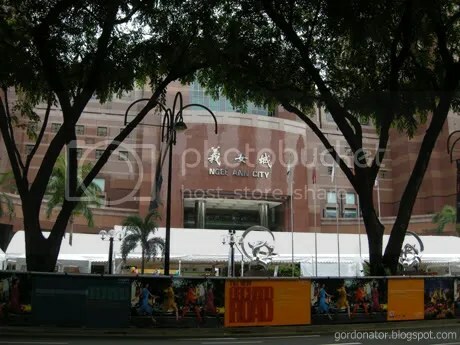 Oh, and what the heck are they actually planning to reconstruct along Orchard Road, aside from that new ION shopping complex they’re building over the old Orchard MRT entrance. Lol at the first pic.. Maybe he can climb up the tower and bang his chest like King Kong..
Hmm, wonder how Orchard Road will look like when the upgrade is complete..
lol no i didn’t thought of that but hey that’s funny. i think they are going to expand the pavement. like what u see in the 2nd pic. finding a parking lot in orchard road is already tough. let alone a gundam. lol. anyway i believe in future they will close off the road on weekends so we can walk on the streets. like in akiba. that gundam looks like a destroy version. he’s way too big ^^. renovation of orchard road, What`s that for? hey now that u mention it, ya u are right. lol. to attract more people i guess. orchard road is so crowded on weekends. it’s about time they expand the pavement. there should be a floor plan inside the mall. it’s not hard to find. kino is on the 3rd floor. Try parking that in my great benefit country Malaysia. It’ll get hijacked, split into parts for easy smuggling and then sold rather cheaply in Thailand or Vietnam. how long have u been away?